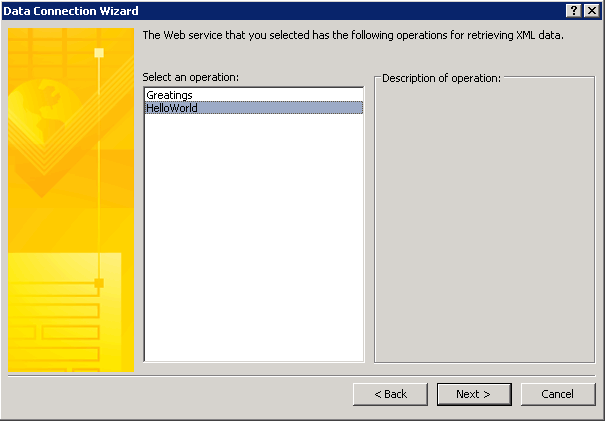 In this article i will explain a well known problem about web service connection problem on your sharepoint servers behind SSL offload Load Balancer or TMG reverse proxy enabled topologies. What is SSL Offload and Acceleration: Depending on the workload, processing the encryption and authentication requirements of an SSL request can become a major part of the demand on the Web Server’s CPU and as the demand increases the users will see slower response times. To remove this demand from the Web Server a Load Balancer may be used to terminate the SSL at the Load Balancer. Some Load Balancer appliances include specialized hardware to process SSL. When a Load Balancer terminates the SSL connections the requests are converted from HTTPS to HTTP in the Load Balancer before being passed to the Web Server. So long as the Load Balancer itself is not overloaded this feature will not noticeably degrade the performance perceived by the end users. So lets explain our topology. We have 2 WFE server and a Hardware Load Balancer. HLB : Hardware load balacer device which is configured SSL Offload. our portal even if they write http://blog.bugrapostaci.com it will redirected to SSL httpS://blog.bugrapostaci.com according AAM configuration. 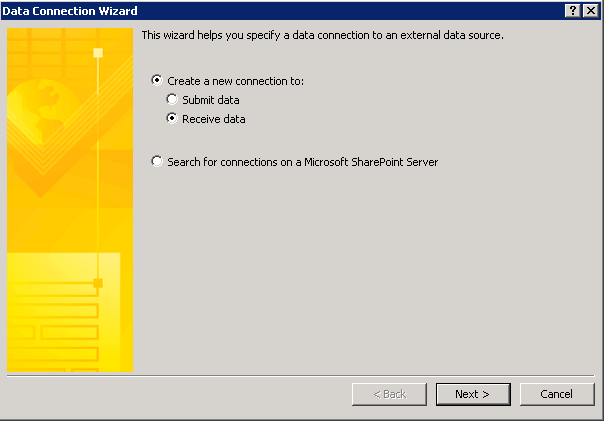 But on the server’s browsers i mean if you connect to WFE1 or WFE2 you can not browse the site with using SSL because there is not any SSL implementation configured on your sharepoint servers. (also this is which we want for performace) unless redirect to outside port of HLB which is mostly prohibited for security. So you can browse your portal using HTTP protocol only on WFE server’s browsers reversly client action. Ok so far so good What is the problem ? 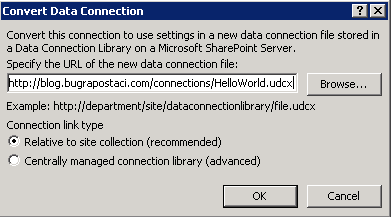 You have a developer machine outside of the server farm and can able to create Infopath Web Forms using Sharepoint Designer or Infopath 2010 .And they can publish their form to sharepoint and see all forms are working correctly by instead of SSL communication. 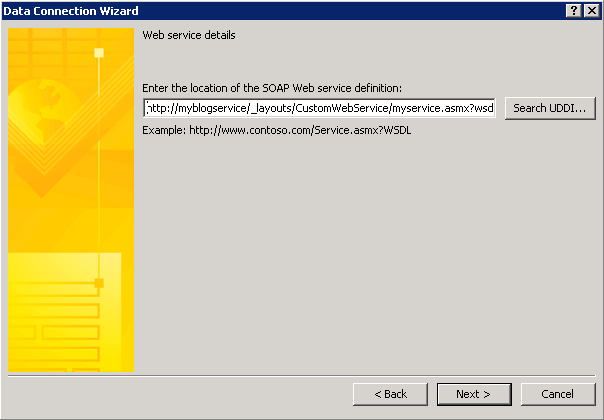 But what if one of the InfoPath form needs to connect a web service which is already publishing on our sharepoint portal “/_layouts/CustomWebService/myservice.asmx” it can be built in sharepoint web service too but in this scenario is customized asmx file. 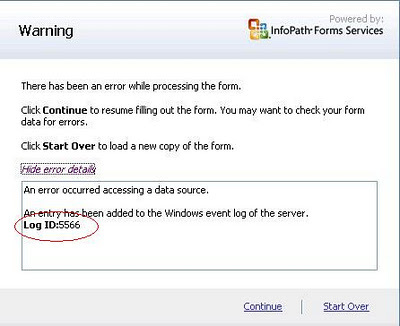 You will get the 5566 connection problem when you try to open this infopath form after publish to server. 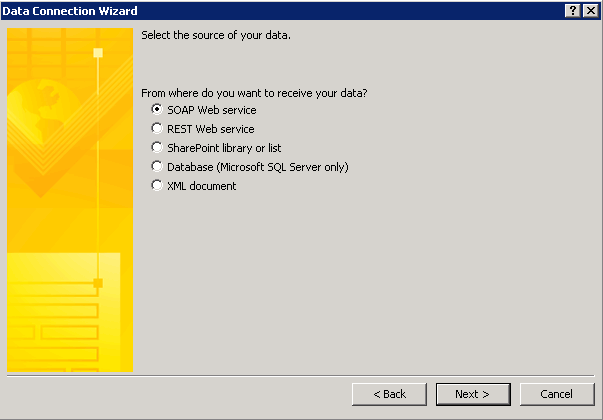 Because when you working with your infopath form in InfoPath2010 (in client machine) you can able to configure your web service connection with HTTPS. if you test form your client computer’s browser you can see WSDL without any problem. you can configure a rule for HLB (if it is configurable) that server request can over through directly load balancer by using https .mean you should allow the server requests pass through HLB even if requester machine itself. (But this time you may encounter with double-hop scenario).But somehow if you can not configure your LB or prohibited by security reson or faced with double hop you need second solution which is a little complicated. ” http://myblogservice” Do not add any AAM record for it. If you create an AAM record it will rewrite your service url as https again. 3) Give only the developer machines to direct access http://myblogservice for able to create their infopath form correctly. 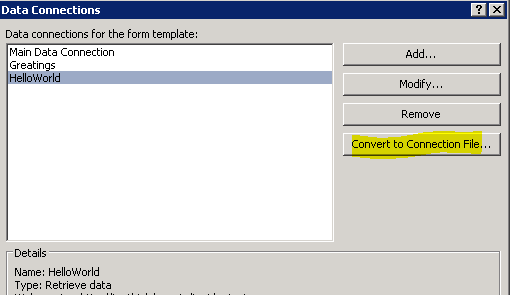 4) Enable Cross Domain options for InfoPath Services. 7) And publish your forms. web service it will use http protocol which can be used by servers and you can able to browse your infopath for correctly without any connection error.